Where will you go this summer? Funding available for internships outside of the UK! Thinking of undertaking an internship outside of the UK this summer? 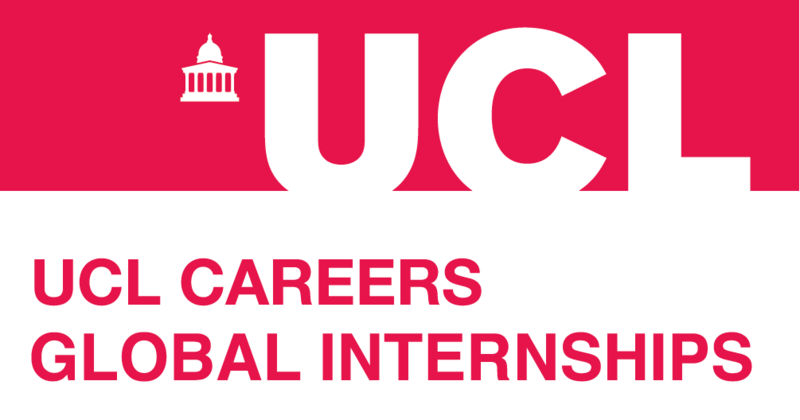 Applications have opened for UCL’s Global Internships Bursary, which provides financial support for students who have sourced their own summer internship in 2019. Grants of £500 are available and can be used to offset costs associated with working overseas such as flights, visas, vaccinations and living costs. Applications close on 28th April (23.59). Eligibility applies. See more details and how to apply. Why did you choose to undertake an international internship? My main criteria for an international internship was to be able to work at the UN. 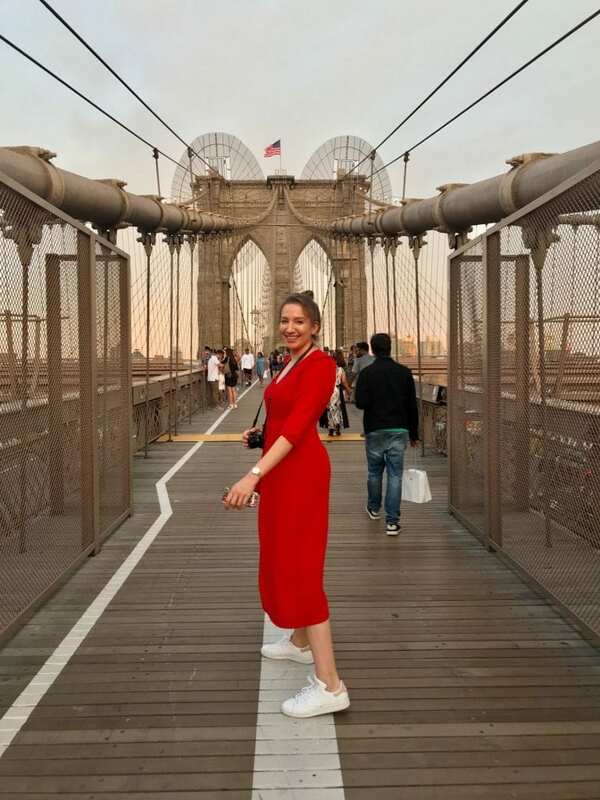 I did not choose the country per se, as there are only two permanent Missions of Luxembourg to the UN in the world, and the spot in New York was open. Yet the fact that the internship was international, and in a new country, made the experience much more valuable. Hard work and responsibility at the workplace, combined with the immersion into a new culture and city also made it unforgettable. What did you do doing your internship? My tasks were many and varied, including general assistance to the diplomatic agents of the mission: assistance in report writing of meetings, tracking the activities of the different bodies of the UN, and daily general and specialised press screening. Moreover, I participated and assisted speechwriting in side events like “Children and Sustainable Development” and “Safer Roads and Inclusive Transportation”, and attended a number of high-level plenary meetings. How did you immerse yourself in the culture of a new country? Before going to New York, I had never been to the United States, nor had I ever really travelled to a new continent by myself. I think one of the most important things is planning. In order to immerse yourself in the culture of a country, you need to understand it first. Of course, it is also key that you leave space for spontaneous and unplanned moments, but you need to make sure you know enough about the country so as not to miss out on great opportunities. What was the most useful part of your internship? The conversations I had and the speeches I was able to listen to. Getting a grip of how the UN works and most importantly how the people inside this huge international organisation think and act is only possible by witnessing and being a part of it. What were some of the challenges you faced during your internship? Adapting to a new environment, new colleagues and a new job. It was a lot to take in at the beginning, but the people I met there were very caring and helped me overcome most challenges. Being on your own is not easy, but you get the chance to learn a lot about the world and yourself. Do you have any tips for other students thinking of doing an internship overseas? Be open to everything and don’t let your fear of the unknown stop you. Observe and listen carefully, adapt to your role. Connect with people and experience the city and culture. With so much emphasis placed on the ‘before’ and ‘during’ phases of an internship, it can be easy to forget just how important it is to put time aside at the end of the experience to ensure you are truly making the most of it. The benefits don’t, and certainly shouldn’t, come to a grinding halt the minute you leave the office on your last day and, whilst things are still fresh in your mind, this is absolutely the best time to indulge in a bit of reflection. Take time to think about the skills you learned and developed, both technical and transferable. If you didn’t receive a formal appraisal during your time within the organisation, think about any informal feedback or comments that you received. Make concise notes of the roles you played in projects, the responsibilities you were given, and the skills you used in order to make this happen. Can you identify what you feel was your biggest achievement? Or the area where you made the most impact? Make a record of names of colleagues, departments you worked within, projects you were involved with – all this detail will be much clearer to you now and may be needed in the future. Hindsight is a great way of learning and improving, so put time aside to think of any ways you could have made the experience better, or that you would change if there was a ‘next time’. Perhaps you felt unprepared on your first day and would have benefited from a bit of time spent researching? Maybe time management wasn’t your strong point and you need to do some learning around ways of planning your working day in order to meet deadlines more comfortably? Alternatively, this may be a question of proactivity and doing everything you can to make the most of the opportunities afforded to you. Do you regret not asking more questions? Perhaps there is a particular area of business you would like to have learned more about but never had the confidence to put yourself forward. Mistakes are there to be learned from. So, aside from the practical tasks that the end of an internship should initiate (eg. updating your CV and ensuring you are connecting with contacts via LinkedIn) don’t underestimate the benefits that can be gained from some good old fashioned thinking time. As much as we want to rush on to the next thing on our ‘to do’ list, give yourself time and space to properly consider and reflect on the experience. Internships are a wonderful opportunity that you should seek to make the very best of, both before, during AND after. The following is based on the experiences of a Careers Consultant who has previously managed internship programmes in a range of sectors. When you are hired as an intern, this is typically to complete a short-term project or task over a specific period of time. If you are an intern for an SME (Small and Medium-Sized Enterprise) you may find yourself getting very involved in a number of aspects of the business. Internships in SME’s and large organisations may sometimes lead to graduate jobs. Set yourself objectives before you start: It’s good to have a think about what you would also like to get out of your time there (beyond being paid!). What are the skills and competency gaps in your CV? What 2 things do you want to leave the internship having achieved? Make sure you know what the expectation is: Interns are sometimes surprised when they learn at the end of the internship that all had not gone as smoothly as they had presumed. It is really important you know what your manager expects of you. If in doubt, ask! Making mistakes: How will you know when you’re making them? What can you put into place to avoid this happening again? Who will you approach for feedback (tip: don’t just rely on your manager for feedback). Managing workload effectively: Your work may come from multiple people so it’s important to remember to manage your time well, prioritise the most urgent work and manage their expectations. If you’re struggling to meet a deadline, you should be transparent about this and tell people in good time – 5pm on a Friday will not leave a good impression. Seizing opportunities: The most important thing to remember is that you have been recruited to do a specific job. Anything over and above this is a bonus but it’s worth mentioning anything you would like to be involved in with your manager. Generally, if you’re doing what is expected of you and what you want to do doesn’t impact on the work, managers tend to be flexible. Being proactive: In the unlikely event of any ‘down’ time, look for work. Mention to your manager that there is a break in your workload and suggest some potential pieces of work. Be realistic about what you can achieve, however! Build your network: One of the best things about being in an organisation is absorbing its culture and getting to know its people. After all, these might be your future colleagues! While you are there, take the opportunity to get to know your department and pretty much anyone you can. Remember to stay in touch, which you can do through email, Linkedin or by phone. With many of you now securing internships for summer, or working committedly towards this end, it is natural that your thoughts will be shifting to the forthcoming opportunity and what to expect from it. There are several rules to follow to ensure that you make the most of the experience. Nerves may be fraught on day one and that is to be expected but make this a more comfortable experience for yourself by doing prior research into the company and the particular department you are operating in. No one will expect you to know everything but having an idea of the challenges and priorities facing the organisation will get you off to a great start. Each working environment comes with its own set of unwritten rules and norms. Watch those around you and observe their behaviours and actions. Some companies will be more formal than others but all will expect a level of professionalism. An internship can be best viewed, after all, a lengthy job interview. Asking questions (within reason) does not make you look stupid, it makes you look smart and curious. You have been given a unique learning opportunity so be sure to use it. Learn from the expertise around you. If you don’t understand something, say so. Better to address it upfront than have to bluff your way through the following weeks. Enthusiasm and eagerness go a long way and are what often make the difference between a good intern and a great intern. Don’t be afraid to make suggestions if you feel there is a better of clearer way of doing a task. Interns bring the benefit of a fresh pair of eyes to a work situation. Ask to get involved in extra projects or to sit in on particular meetings to learn more and immerse yourself in the experience. Make the most of any mentors you are assigned to find out about their route into the industry, the challenges they have faced and the advice they can give. Be receptive to any feedback they give you. Whilst their input is invaluable be sure to stretch your networks wider still. Go out of your way to meet with other people in the organisation and connect with them on Linked In so the benefits may continue beyond the internship itself. There is bound to be a certain amount of apprehension, particularly on your first day. But it is important to remind yourself that you have been selected for this opportunity, often in very competitive circumstances. And that is because the organisation believes you have something to offer. But remember also, that something is not ‘the finished article’ – it is a student who is there to learn and develop. They are not expecting you to run the show but they are expecting you to listen and be willing. The Engineering Fair is coming…. Considering a career in Engineering? The UCL Careers Engineering Fair features some of the top employers from the fields of Chemical, Civil and Environmental, Electronic and Electrical, and Mechanical Engineering, as well as Construction and the Built Environment. in order to research companies, but there may not be suitable structured programmes on offer. You do not need to book to attend our Careers Fairs, but you must bring valid UCL ID to gain entry. 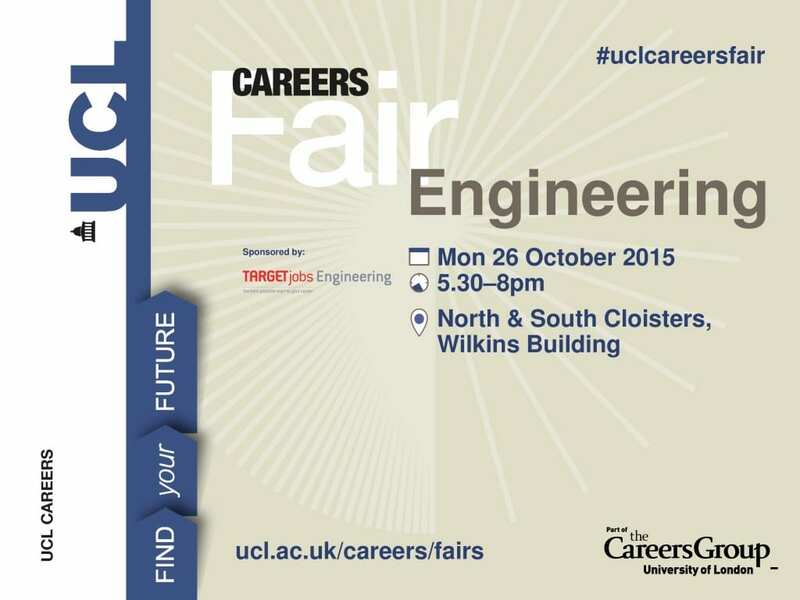 The Engineering Fair 2015 is kindly sponsored by TargetJobs Engineering. Want to find our more about careers within IT and Technology? 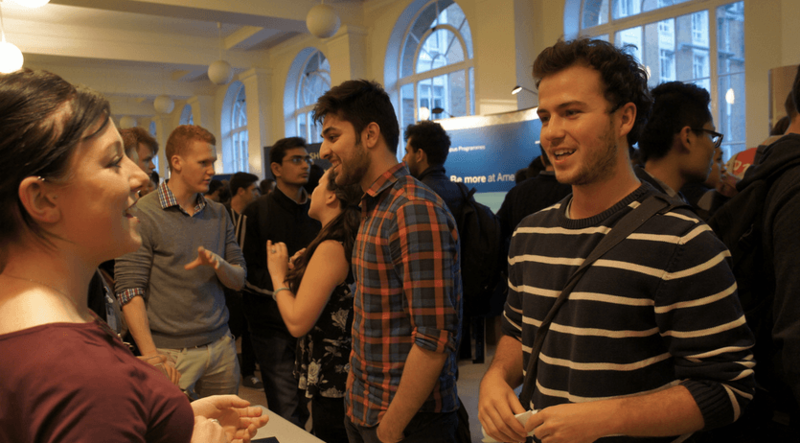 The UCL Careers IT and Technology Fair features some of the top employers in Consultancy, Big Data, Software, Cloud Computing, Telecommunications, Financial Technology and many more. Employers will be hiring for permanent graduate positions, internships and, in some cases, 1st year spring programmes. The fair is open to all year groups but there may not be structured programmes on offer for all students. Some roles will be open to students studying computer science or a related technical discipline, but others will be open to all with an in interest in technology. 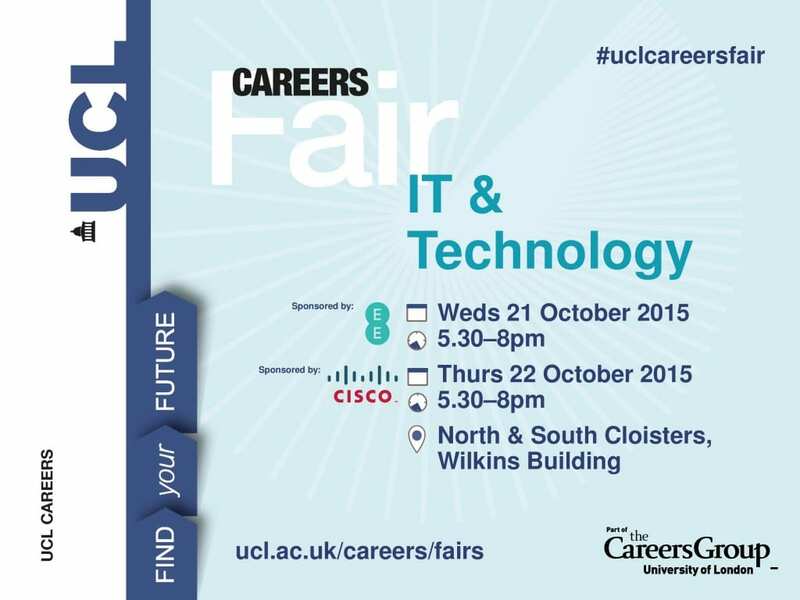 The IT and Technology Fair 2015 is kindly sponsored by EE and Cisco. Interested in a career working with Banking or Finance? The UCL Careers Banking and Finance Fair features some of the top employers from a wide variety of sectors including Investment Banking, Professional Services, Retail and Corporate Banking, Economics, Consulting, Investment Management Actuarial, Insurance and many more. Employers will be hiring for permanent graduate positions, internships and, in some cases, 1st year spring programmes. The fair is open to all year groups but there may not be structured programmes on offer for all students. 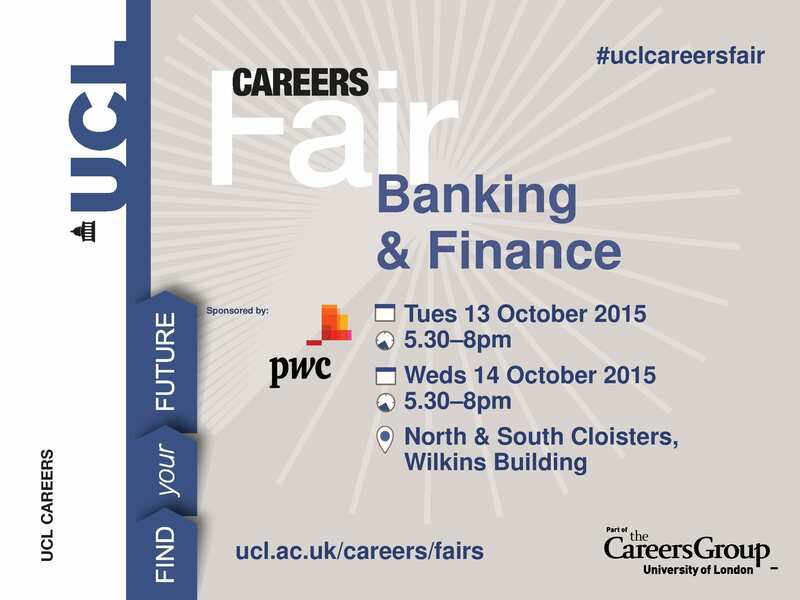 The Banking and Finance Fair 2015 is kindly sponsored by PwC. Considering a career in Management Consultancy? The UCL Careers Management Consultancy Fair features some of the top employers from a wide variety of Consultancy sectors including Strategy, Financial, Brand, Technology and HR. Employers will be hiring for permanent graduate positions and in some cases internships and placements. The fair is mainly aimed at final year and penultimate year students. Other years are welcome to attend in order to research employers, but there may not be suitable structured programmes available. We will be holding Fair Prep sessions – keep an eye for an Alert about these! 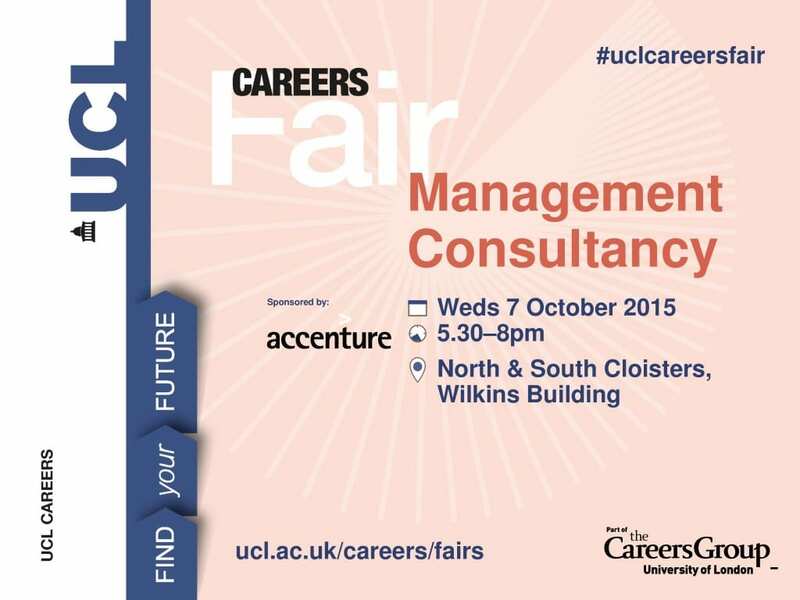 The Management Consultancy Fair 2015 is kindly sponsored by Accenture. > As well as reading the exhibitor profiles, click through to the organisation’s own website to find out more about them. > After your research, decide which exhibitors you particularly want to talk to, and you will be able to ask more informed questions. It can be difficult to understand the difference between big companies within the same sector. Often it is the cultural aspects that make a real difference in the working environment and this can only be appreciated through talking and interacting with representatives at the Careers Fairs. Try to prepare some questions in advance and think about the main points that you would want an organisation to know about you – it can help you feel more confident. > Come along to one of the preparation sessions organised by UCL Careers (starting w/c 5th October). > At the fair, each exhibiting organisation has a stand and their representatives are there to answer your questions about what the organisation does, what jobs they offer to final year students and graduates, what internships/placements they provide to earlier year students, and any other opportunities that they offer. > Often particular insight re. staff experience relating to specific projects they’ve been involved in or training they’ve had can be used as ammunition that can be a real differentiator when answering motivation based questions – ie lots of first hand information not available on any website that other candidates might not be able to offer. > Wherever possible, try to talk to someone on the stand instead of just picking up a brochure. Use the opportunity to ask your questions face-to-face. > If you are feeling a bit nervous about approaching your first choice organisation, it can be a good idea to visit some other stands first to practise your technique. > If you are given a business card, make a point soon afterwards of noting on it anything that it would be useful to remember. Have they suggested you email them with further questions? Did they give you advice on their recruitment process? > Even if you have a ‘hit list’ of exhibitors, consider other organisations at the fair that are less well known. They might be offering just what you are looking for. Remember to bring your UCL ID or GradClub ID card as you won’t be able to enter the fair without this! > Avoid walking round the fair with a group of friends. The exhibitor may not realise that you are interested in them, and you could miss out because your friend happens to be more talkative than you! > If you feel overwhelmed, and don’t know what to do or where to start, make sure you visit the UCL Careers for help. > Staff on the exhibitor stands are often relatively recent graduates who can tell you what it is really like to work in their organization. They may even refer to particular projects that they’ve been involved in or training that they’ve had –all of which is great information for you to use when you apply for a position at their company. This insight is not available on any website and creates a unique impression when it is your time to apply. Is there a difference between work experience, an internship and a placement? With much being said about the value that employers place on job candidates having previous work experience UCL Careers has seen the amount of opportunities for work experience, internships and placements rise drastically over the last few years. At the same time the terminology has become quite confusing and often the words “work experience”, “placement” and “internship” are used interchangeably by students, employers and the general public even though they could mean very different things in terms of what the student will actually experience. Traditionally was associated with a short period of time within a company, such as one to two weeks to gain exposure to an organisation. It might include an element of work shadowing staff to observe what they do in order to understand a role better as well as getting involved in relatively low level tasks to help support the business in a very practical way. Recently the term “work experience” has become an all embracing title for any form of participation in a working environment, and could include volunteering work with a registered charity which may not be paid but would still be counted as work experience. Generally last anything from four weeks to a year. They may or may not relate to your studies and could vary greatly in terms of what the role will involve. Often, and in particular for large companies where they have an established summer internship scheme, the work will be of a similar nature to a graduate role. For these companies the internships are likely to be structured with possibly an element of training. For some sectors such as banking and finance, having an internship on your CV is fairly important if you want to pursue a career in that field. Undertaking an internship on a summer scheme in these sectors can sometimes lead candidates being offered a place on a graduate scheme once they have graduated. However, there are also many other organisations that will offer internships that are not part of a scheme, but will enable you to experience what it is like working in a particular role and sector. The word “placement” varies in meaning but at UCL, placements are thought of as an assessed, integral part of an academic programme and the tasks undertaken will most likely relate to your programme of study. However, many courses at UCL do not have this element within them. If they do, they will usually range from three months to a year, depending on the requirements of your course. The level of work in a placement is usually similar in scope to an internship or graduate role. Placements are likely to be structured and may involve an element of training. Often you would be assisted by course staff in your search for a placement. 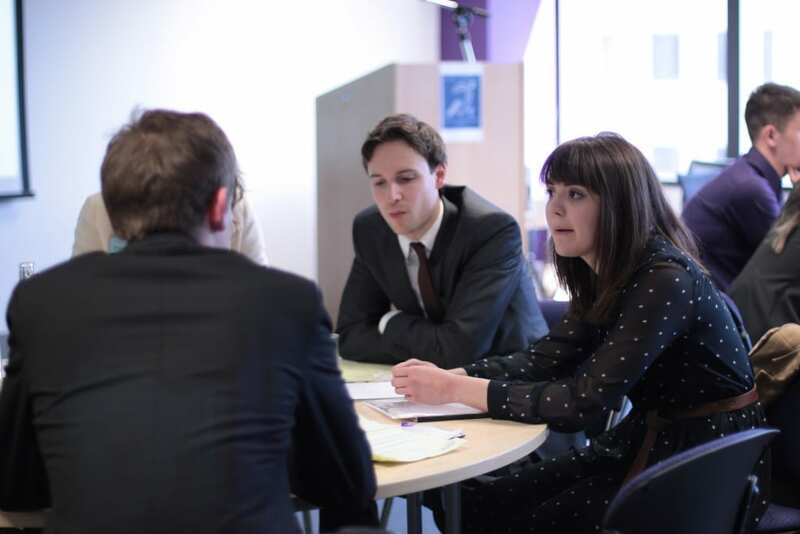 There are also other opportunities out there such as “insight sessions” which are usually offered from employers in the finance, management consultancy and law sectors. These are short periods (days or a couple of weeks) where you have the opportunity to attend events and activities within a company designed to help you understand more about that company, the sector it is in and what roles are available. Often there is a chance to undertake some level of skills training as part of the insight session with the aim to help you understand the skills necessary for the sector. For more information about work experience, internships and all the other types of opportunities use UCL’s Careers Tagged resource and see The Careers Group sheet on Securing Internships and Work Experience. – Rochelle Symons, Placements and Vacancies Manager, UCL Careers.